The City of Chicago has gang bangers opening up Fire Hydrants. In fact, there are so many left open, millions of gallons of water are wasted. The first response crew is the Hydrant Trucks. Department of Water Management lack of material put Chicago Citizens lives in peril. On the “Day Hydrant Truck” is Caulker-in-Charge Ralph Cortes. 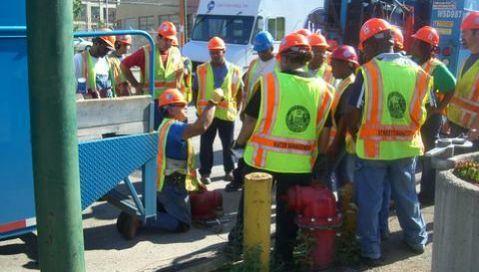 In the picture Ralph is showing new Chicago Water Department Laborers the proper procedure repairing a Fire Hydrant. Also in the picture instructing is Patrick McDonough the former Plumber-in-Charge of the Night Hydrant Truck. The Hydrant trucks are short of material making the job almost impossible. Yesterday Ralph was met on the jobsite by Chicago Management to shut off a Hydrant at 2854 West 21st Place. Water shot out of the Hydrant and into basements across the street. Also the Chicago Water Hydrant Program is in shambles due to the lack of manpower. I also blame Management for downing two Night Hydrant Trucks, a political move that is investigated by the State of Illinois. Patrick McDonough testified at a State of Illinois hearing as a expert. Lets get the ball rolling now and protect our Chicago Citizens!